Critically Endangered Sunda pangolin (Manis javanica) in the lowland evergreen forest of southern Thailand. Credit: T. Ong-in 2017. 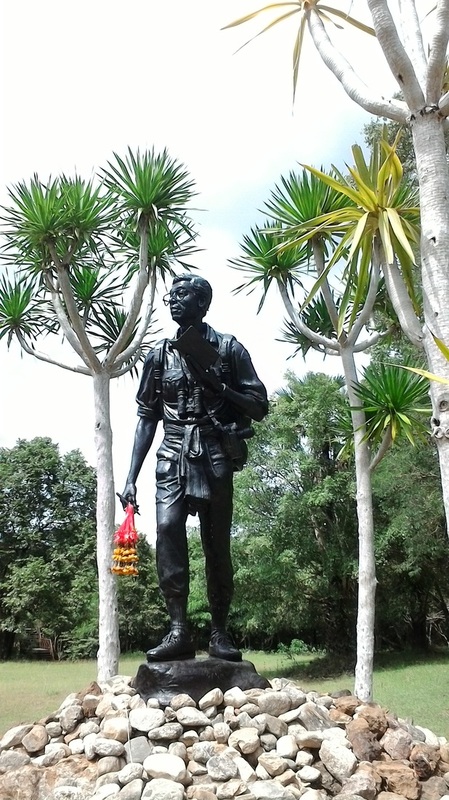 Seub Nakhasathien is the hero of Thai conservationists and wildlife enthusiasts. 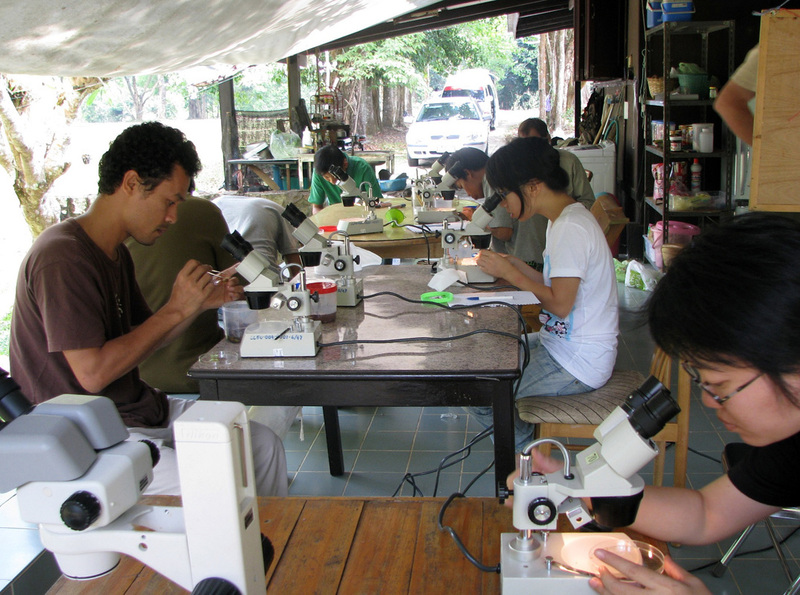 KMUTT students strive to carry forward his mission to conserve biodiversity in Thailand and beyond. Credit: G. Irving, 2015. 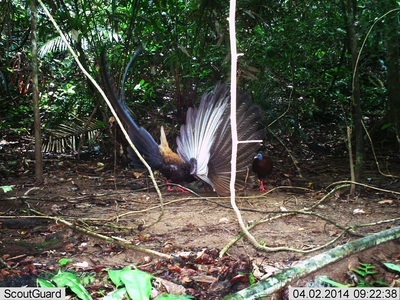 Green Peafowl was uplisted to "Endangered" status in 2009 due to hunting and habitat destruction. 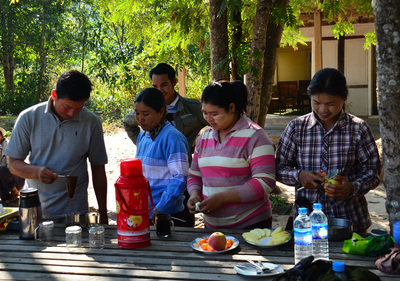 Culturally revered in Myanmar, the species persists in the relative safety of temple compounds in Shan State. Credit: N. Sukumal, 2015. Preparing lunch under blazing midday sun in Mondulkiri Protected Forest, Cambodia. Credit: T. Savini, 2016. 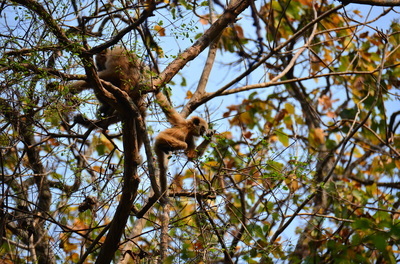 White-handed Gibbon (Hylobates lar) is an endangered species studied by KMUTT in several locations of Thailand, including the dry dipterocarp forests of Huay Kha Khaeng Wildlife Sanctuary. Credit: T. Savini, 2013. 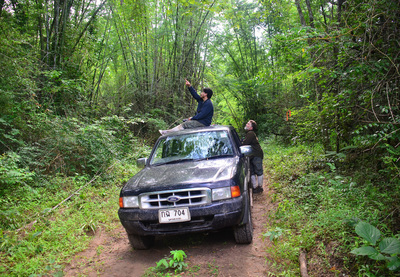 Highway 304 is a dispersal barrier, separating bear populations in the Dong Phayayen - Khao Yai Complex. Students have developed novel methods to study the impact of fragmentation on population density and genetic diversity. Credit: D. Ngoprasert, 2010. Field equipment takes a beating under routine field conditions. Duct tape and elastic hair bands do the trick. G. Irving, 2016. Glandular Horned Toad (Megophrys major) is common in evergreen forests near clear, freshwater streams, from 250 to 2500m. P. Saengtharathip, 2013. 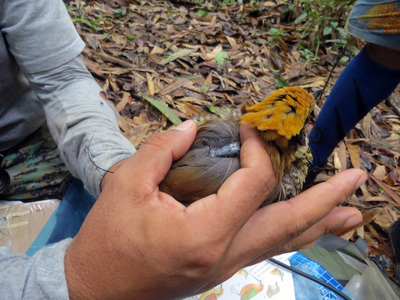 Lowland habitat of endangered Gurney's Pitta (Hydrornis gurneyi) in Tanintharyi Division of Myanmar is rapidly disappearing. 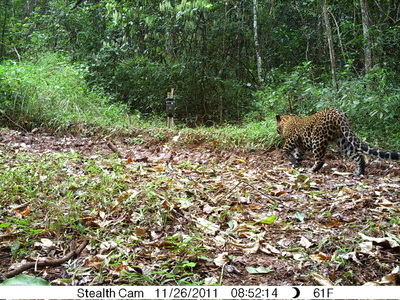 This female is fitted with a radio transmitter for home range analysis that will advise effective management actions. Credit: N.M. Shwe, 2016. 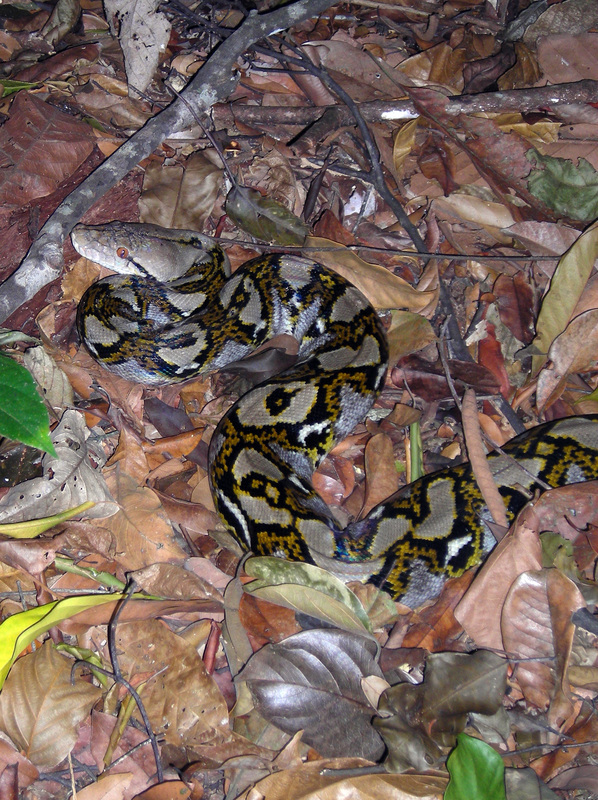 The gorgeous Reticulated Python (Malayopython reticulatus) is common in Khlong Saeng Wildlife Sanctuary. Somehow, two researchers walked directly over this individual, laying unnoticed, without stepping on it. Credit: G. Irving, 2016. 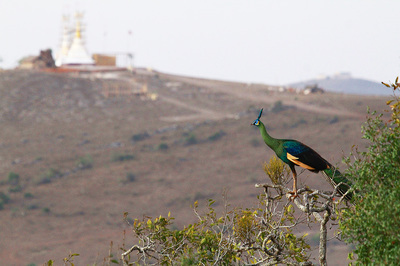 Buddhist monks are key stakeholders for protection of endangered Green Peafowl in Eastern Shan State, Myanmar. Here, researchers explain use of telemetry and disseminate posters on managing agricultural areas for peafowl conservation. Credit: T. Savini, 2016. Bengal Slow Loris (Nycticebus bengalensis) is a primate listed as vulnerable by IUCN. 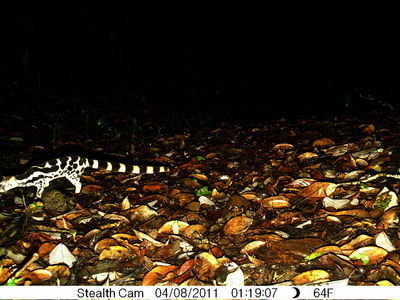 Two students have conducted research on the species, including this individual at Khao Ang Reu Nai Wildlife Sanctuary. 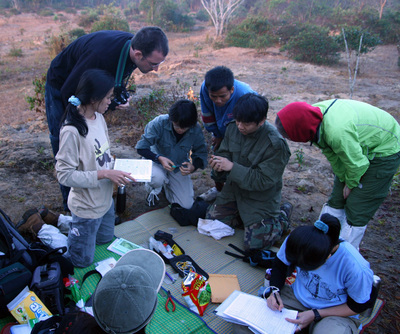 Credit: M. Pliosungnoen, 2007. Assessment of Green Peafowl habitat utilisation and home range, using radiotelemetry, in Huay Kha Khaeng Wildlife Sanctuary. Credit: G. Irving, 2015. 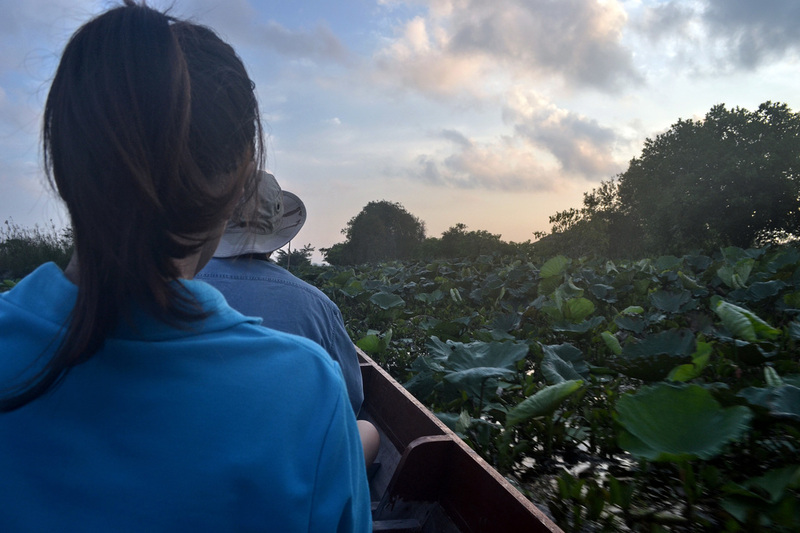 Dolphin watching has gained popularity in southern Thailand. One targeted species is the Indochinese Humpbacked Dolphin (Sousa chinensis). 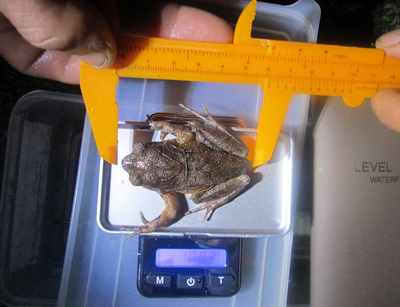 Population monitoring, using distance sampling, is utilised to monitor population status of the various species. Credit: T. Savini, 2013. 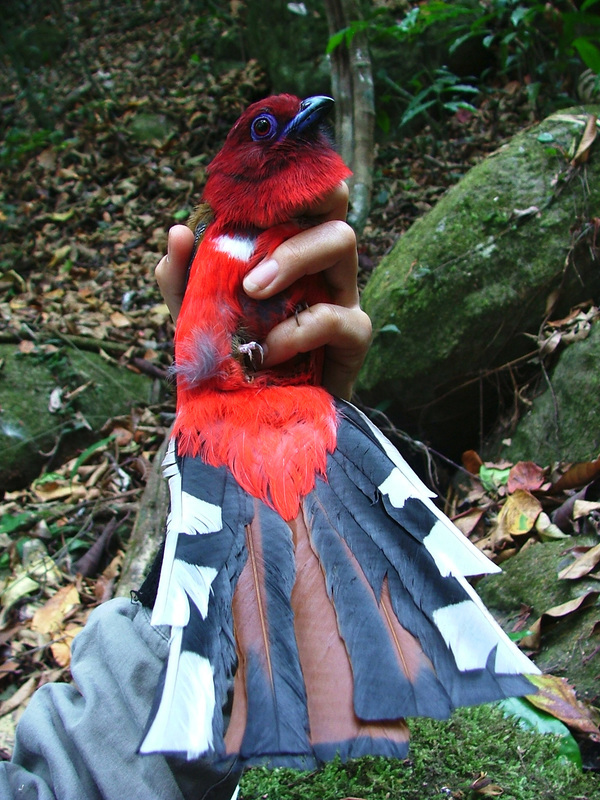 Biology of White-rumped Shama (Copsychus malabaricus) is studied by several students. 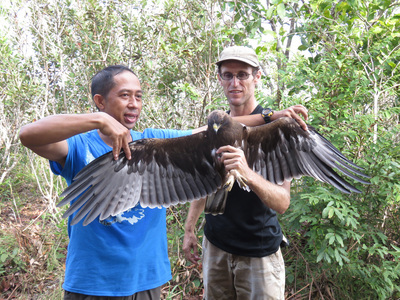 Research includes nest site selection, nest predation, nesting success, and fledgeling dispersal. 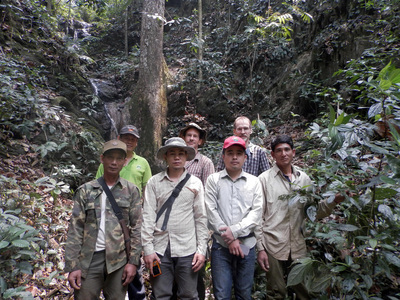 Credit: T. Chotprasertkoon, 2014. Gibbons and macaques are important seed dispersers in Southeast Asian forests. Credit: J.M. José-Domínguez, 2013. 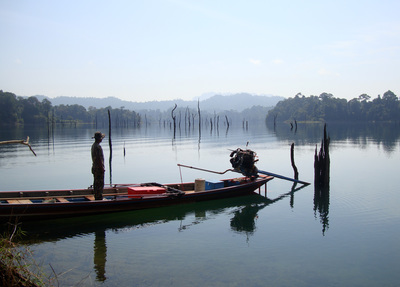 Morning on Chiew Larn Reservoir. 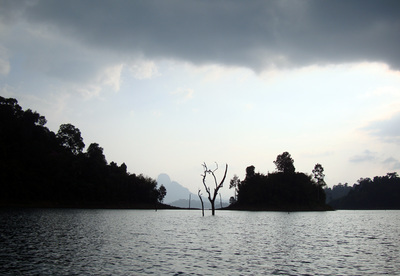 Constructed in 1987, the Rajjaphrapa Dam flooded a unique lowland rainforest in the heart of the Khlong Saeng - Khao Sok forest complex. Credit: G. Irving, 2016. 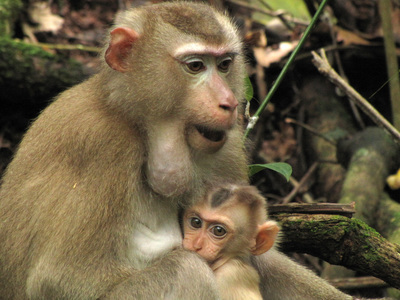 By storing food in their cheek pouches while moving between habitats, Northern Pig-tailed Macaques are able to reduce inter-troop competition while also providing an important ecological function in seed dispersal. Credit: J.M. José-Domínguez, 2012. 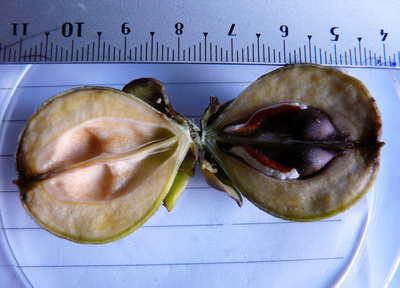 Primates play an important role in seed dispersal for tropical trees such as this Aquilaria crassna, a critically endangered heartwood species. Credit: A. Albert, 2009. 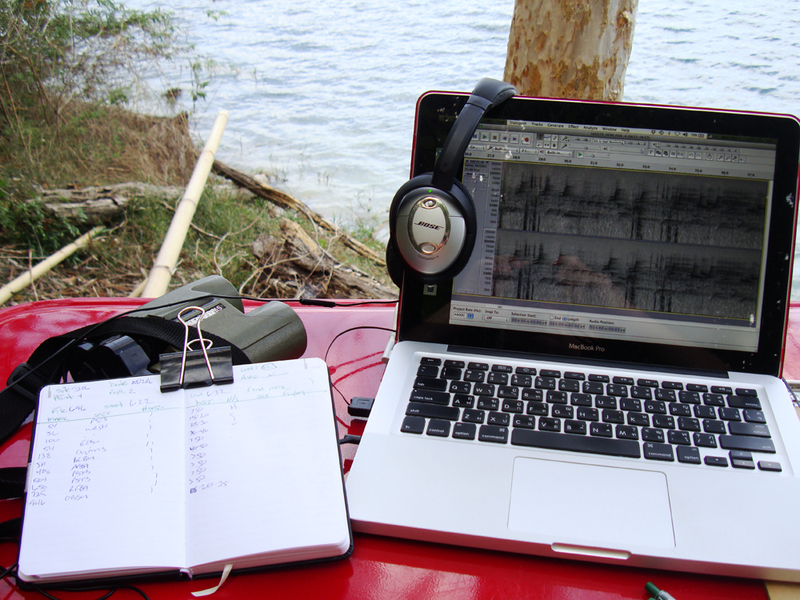 Entering avian point count data from audio and field notebook. 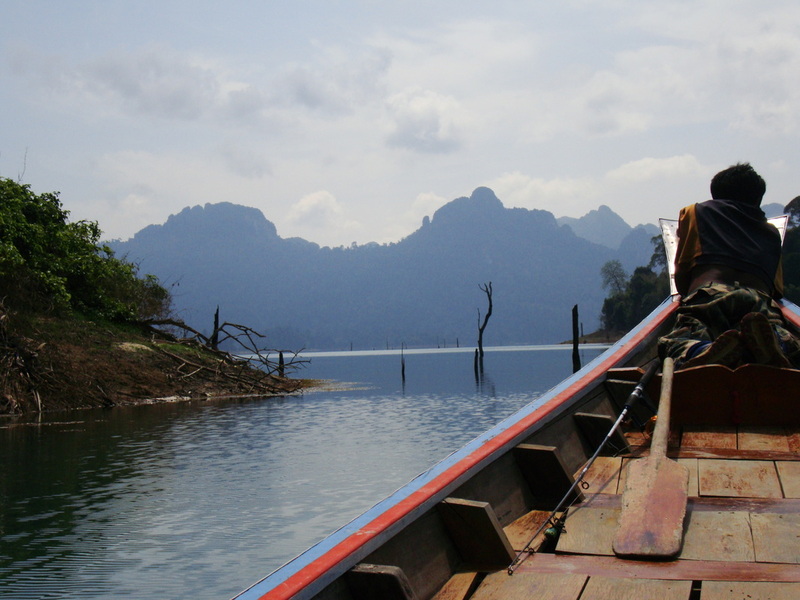 Chiew Larn Reservoir, Khlong Saeng Wildlife Sanctuary. Credit: G. Irving, 2016. 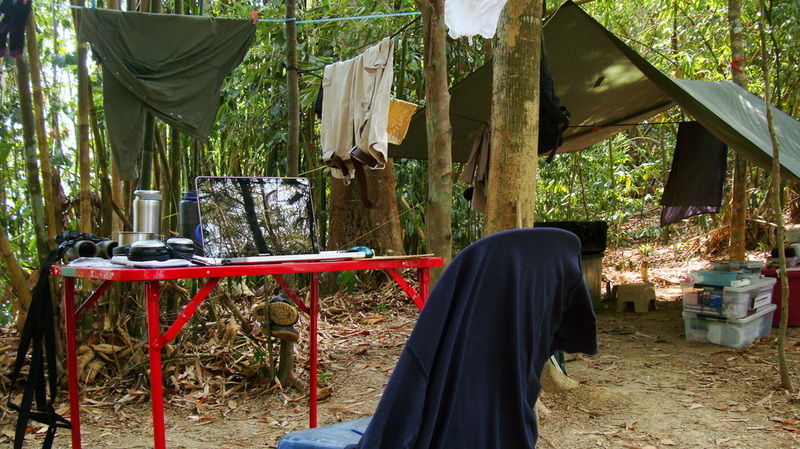 Late morning at a remote island camp in Chiew Larn Reservoir. Upon completing morning point counts, the rest of the day is spent entering avian point count data from audio recordings. Credit: G. Irving, 2016. Office with solar power and a view - at Chiew Larn Reservoir, Khlong Saeng Wildlife Sanctuary. Credit: G. Irving, 2016. 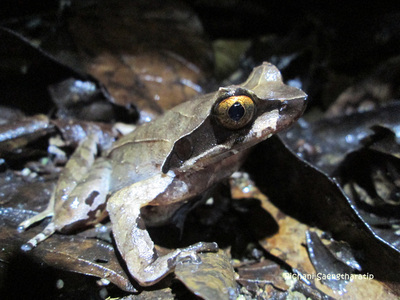 Anurian survey in Huay Kha Khaeng Wildlife Sanctuary explored altitudinal and habitat variables, as well as prevalence of chytrid fungus. Credit: P. Saengtharatip, 2013. 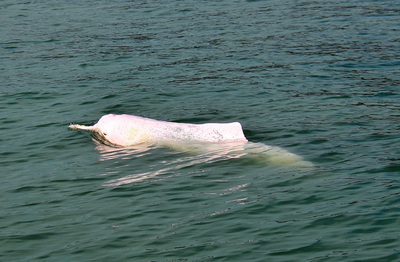 Great Argus (Argusianus argus) is a near-threatened galliforme species. 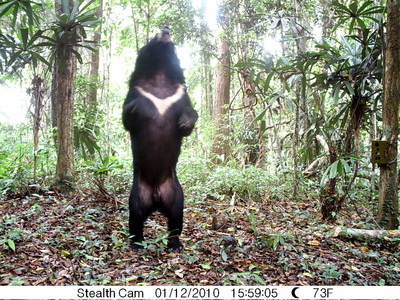 Males such as this individual in Bala Wildlife Sanctuary engage in group displays called "leks" during the breeding season. Credit: T. Dawrueng, 2014. 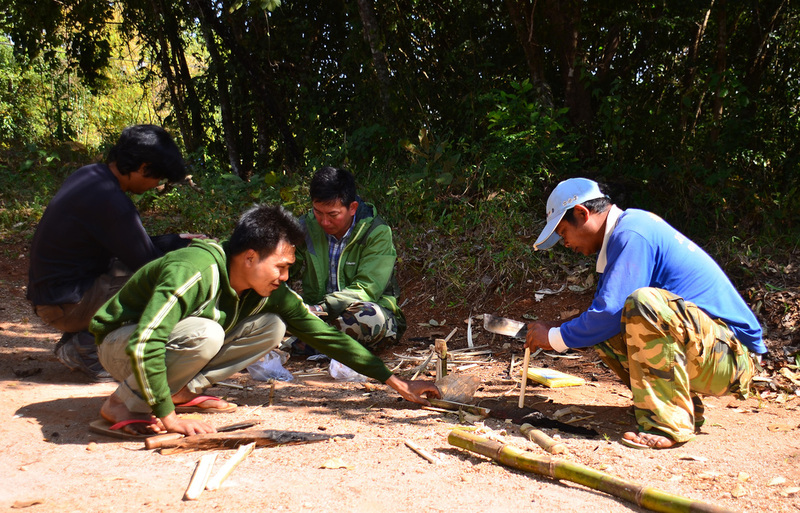 With the help of a local craftsman, students prepare a snare to capture Green Peafowl on the grounds of an ancient pagoda in Shan State, Myanmar. Credit: T. Savini, 2016. Another day on the lake at Chiew Larn Reservoir, Khlong Saeng Wildlife Sanctuary, southern Thailand. Credit: G. Irving, 2016. Recognisable by the presence of large amount of bamboo cages, crab fishing is a common Illegal Human Activity detected by camera trap in the Sundarbans National Park of Bangladesh. Credit: A.N.M. 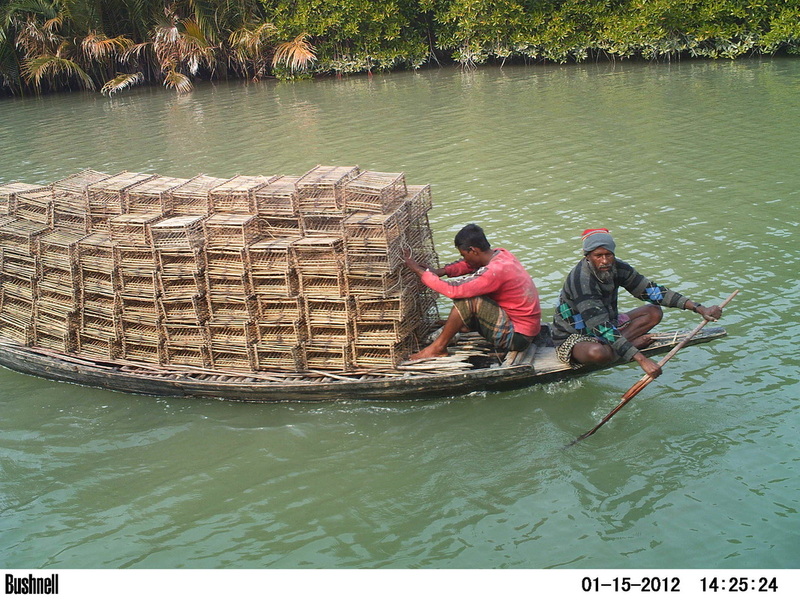 Hossain, 2012. 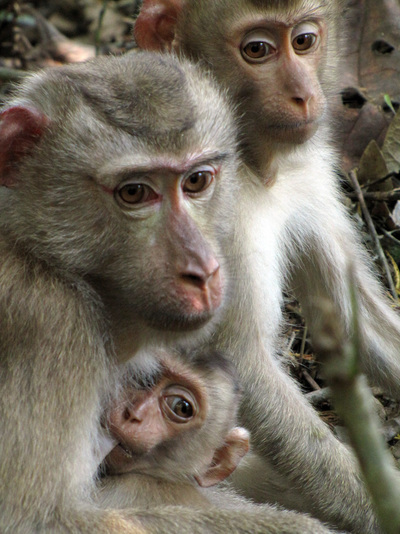 Members of a Northern Pig-tailed Macaque troop studied in Khao Yai National Park. Credit: J.M. José-Domínguez, 2013. 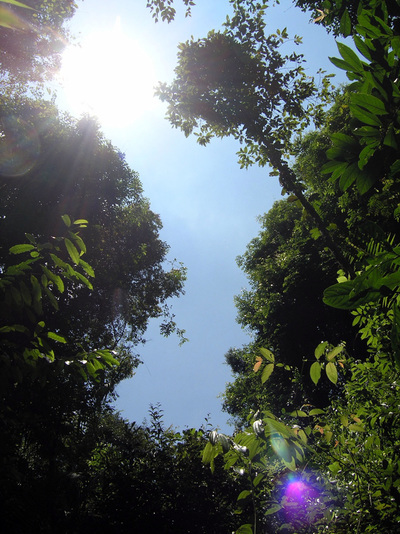 Submerged canopy of lowland evergreen forest at Chiew Larn Reservoir pokes above the surface. 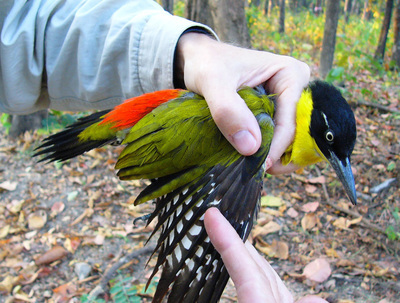 Rajjaphrapa Dam extirpated species from the forest complex, as well as Straw-headed Bulbul from Thailand. Credit: G. Irving, 2016. Remote camp in a seasonal clearing at confluence of Khlong Saeng and Chiew Larn reservoir. At night, gaur and sambar grazed within metres of our hammocks and a loud herd of elephants kept us on edge. Credit: G. Irving, 2016. 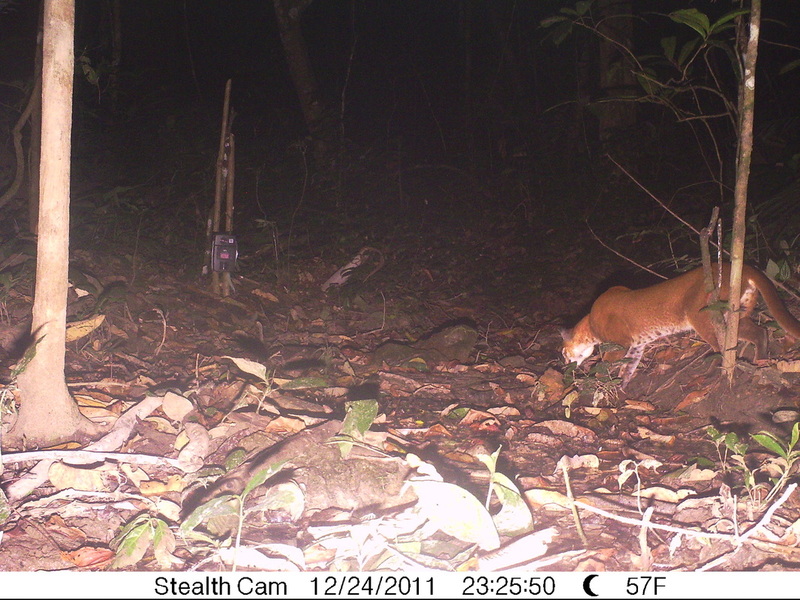 Tigers, such as this individual tracked in Thung Yai Naresuan Wildlife Sanctuary, are a landscape-level predator that is particularly vulnerable to habitat fragmentation and poaching. A. Simcharoen, 2010. 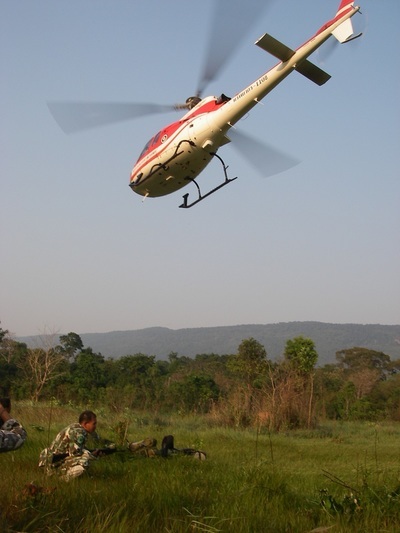 Students accessed research site by helicopter in Khao Yai National Park. 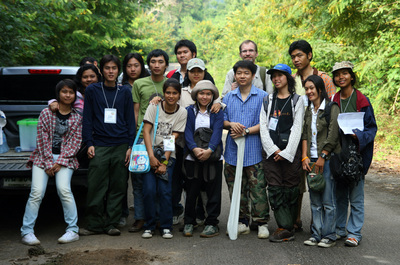 Credit: D. Ngoprasert, 2010. 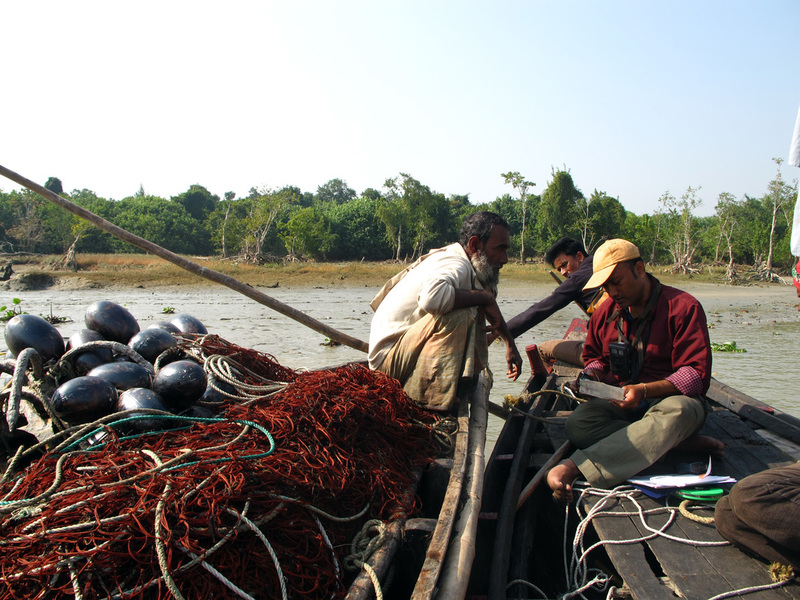 Checking the license of a fisherman illegally found in a protected area, Sundarbands, Bangladesh. Credit: T. Savini, 2012. Bird migration surveillance survey in Khao Yai National Park - Christmas Day 2007. 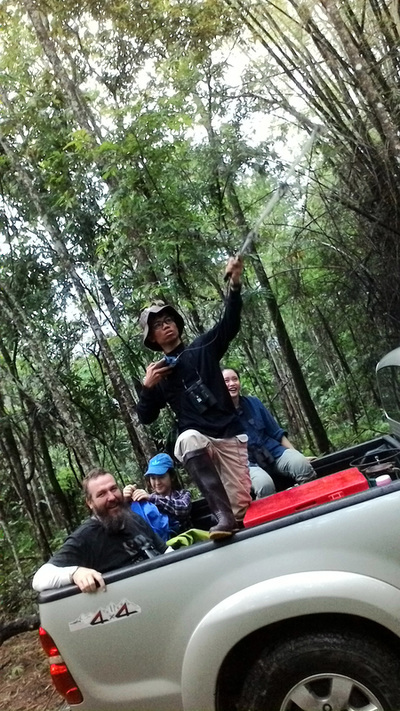 The hard life of an adviser in the field, fetching water for his students in the heat of Mondulkiri Protected Forest, Cambodia. Credit: T. Ong-in, 2016. Preparing breakfast with park wardens after an early morning survey in Chatthin Wildlife Sanctuary, Sagaing Division, Myanmar. Credit: T. Savini, 2015. 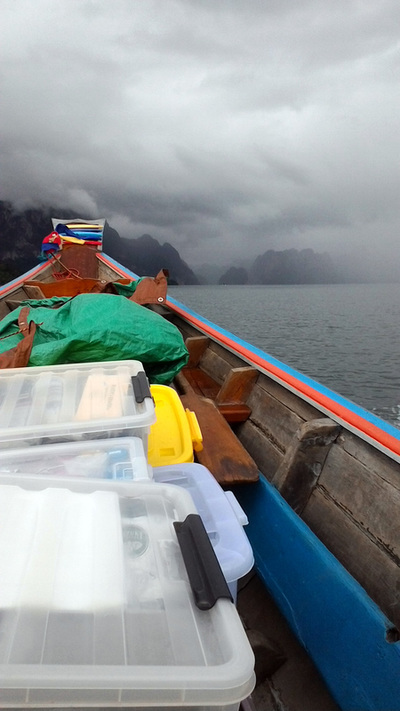 First day of fieldwork at Khlong Saeng - January is still wet in southern Thailand. Credit: G. Irving, 2016. The Chinese Serow (Capricornis milneedwardsii) is an elusive near-threatened goat-like ungulate found across the Indo-Burma Biodiversity Hotspot. This individual posed for a self portrait during a galliforme survey in Northeast Thailand. 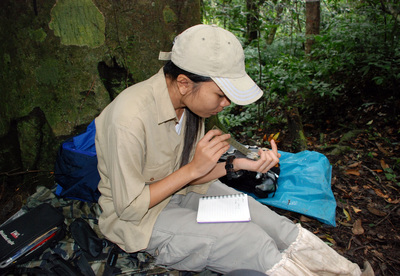 Credit: S. Suwanrat, 2010. 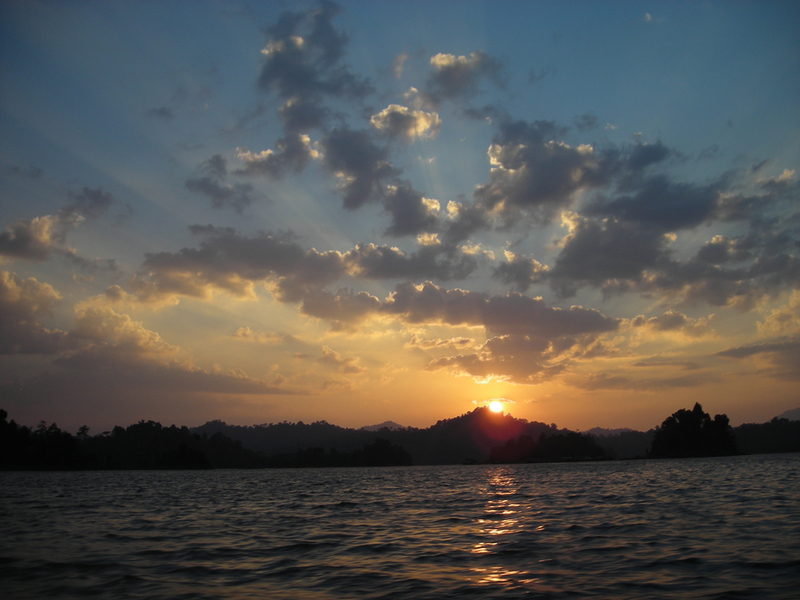 Sunset at Chiew Larn. Credit: G. Irving, 2016. 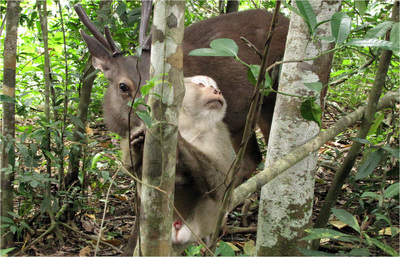 Odd behaviours are sometimes observed during long hours of primate research. Here, a Sambar Deer decides to find out how a Northern Pig-tailed Macaque smells. 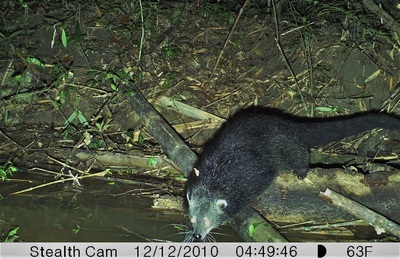 Credit: J. M. José-Domínguez, 2013. During tiger surveys in the Sundarbans mangrove forest, the study team remains on the research boat 24/7 to prevent being attacked by their target species. Credit: G. Gale, 2010. Bird survey in Huay Kha Khaeng Wildlife Sanctuary. Credit: D. Khamchka, 2010. A Black-headed Woodpecker (Picus erythropygius nigrigenis) in Huay Kha Khaeng. This subspecies has a dark bill while the nominate subspecies (P. e. erythropygius) of eastern Thailand and Indochina has a yellowish bill. Credit: D. Khamcha, 2010. Camera trap training for forestry staff during survey for the critically endangered Saola (Pseudoryx nghetinhensis) in the Annamite Mountains of Lao PDR. 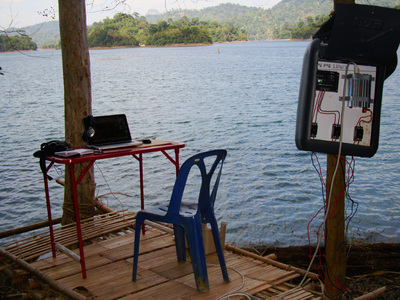 Credit: C. Phommachanh, 2014. 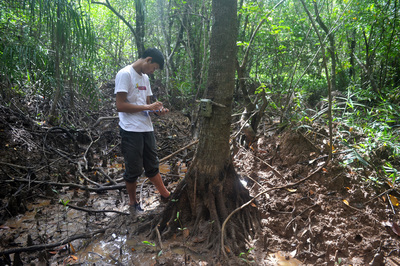 Treefall gaps are important locations for study of successional forest in Khao Yai National Park. 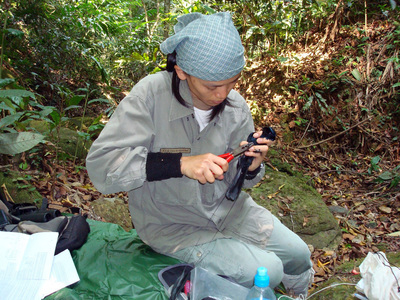 Credit: T. Ong-in, 2010. 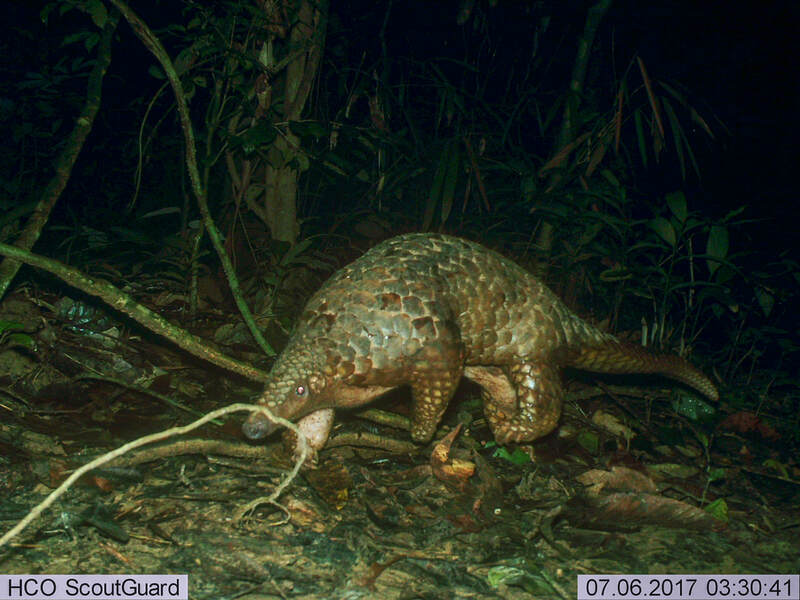 Home range analysis and habitat utilisation by Siamese Fireback (Lophura diardi) was undertaken in Khao Yai National Park, Thailand. Credit: T. Ong-in, 2010. 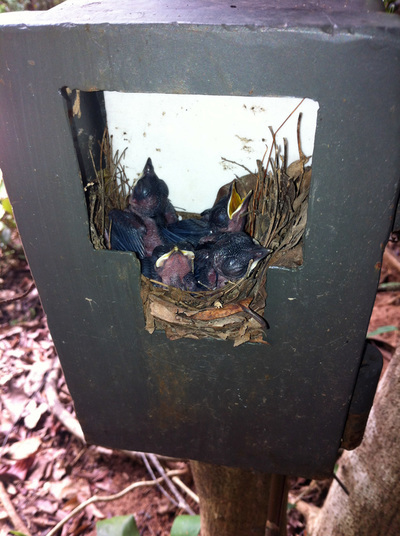 Nest survival study of Abbott's Babbler (Malacocincla abbotti) in Khao Yai National Park. 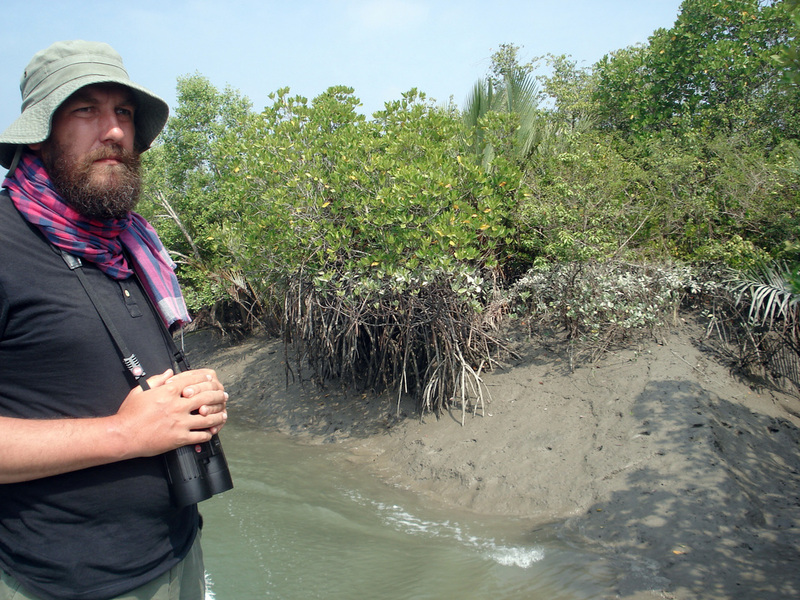 Searching for tiger footprints at low tide in the vast Sundarbans mangroves of Bangladesh. Credit: A.N.M. 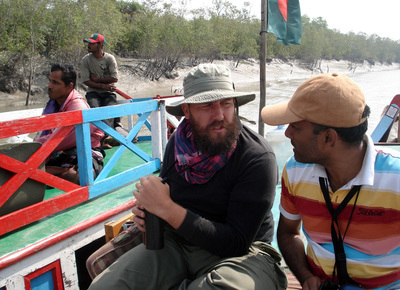 Hossain, 2010. 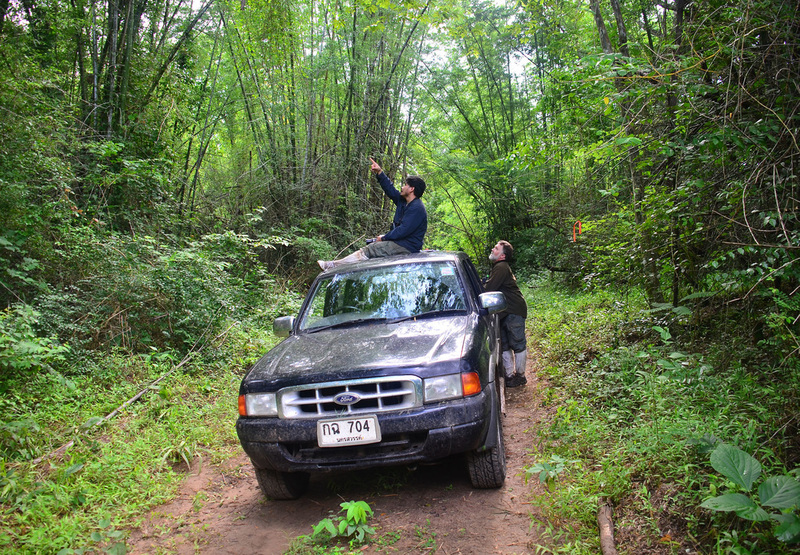 Estimating White-handed Gibbon density in the dry dipterocarp forest of Huai Kha Khaeng Wildlife Sanctuary, Thailand. Credit: T. Savini, 2012. Earth science field trip to Kaengkrachan National Park with undergraduate students. 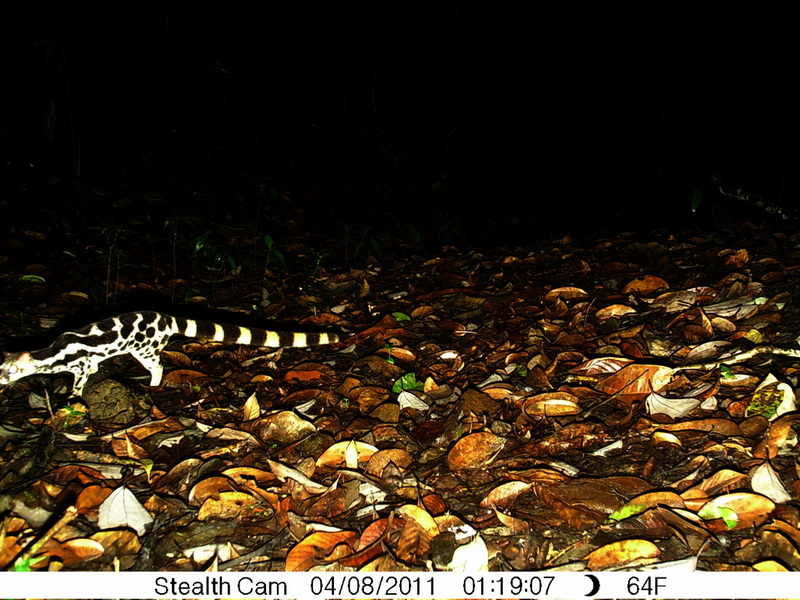 Inhabiting Sundaic evergreen forests and edges, the Banded Linsang (Prionodon linsang) is a small carnivore occurring at low densities and is rarely camera trapped. 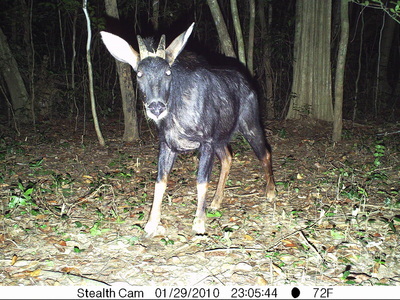 This individual in Thung Yai West is among the northernmost confirmed records of its range. Credit: W. Chutipong, 2011. 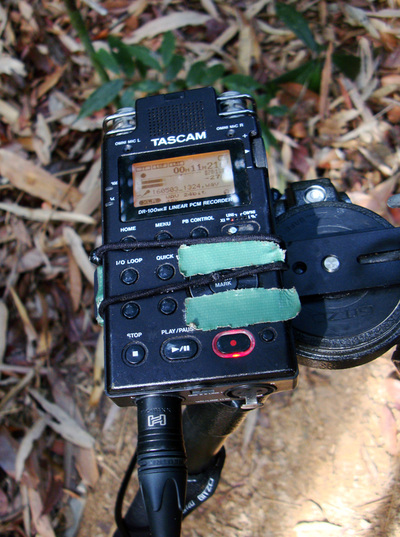 Radio tracking of Siamese Fireback nesting (unusually) in dry dipterocarp forest at Sakaerat Environmental Research Station. Credit: N. Sukumal, 2011. Habitat survey for the endangered Green Peafowl in Huay Kha Khaeng Wildlife Sanctuary. Credit: T. Savini, 2013. 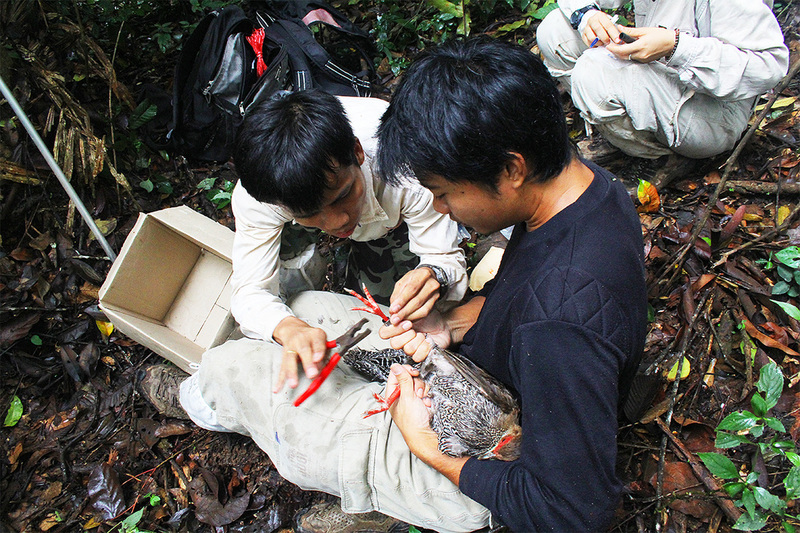 A female Silver Pheasant (Lophura nycthemera) studied for home range and nest site selection in Khao Yai National Park. D. Khamcha, 2011. Red-headed Trogon (Harpactes erythrocephalus) are quite common on the Mo Singto Permanent Biodiversity Plot in Khao Yai National Park, Thailand. Credit: W. Sankamethawee, 2007. 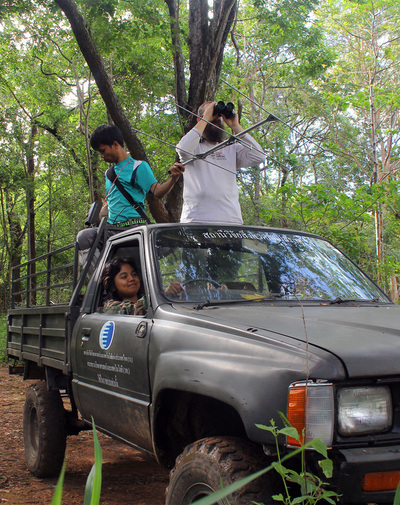 Lesser Racket-tailed Drongo (Dicrurus remifer) caught during survey work at Khao Yai National Park. 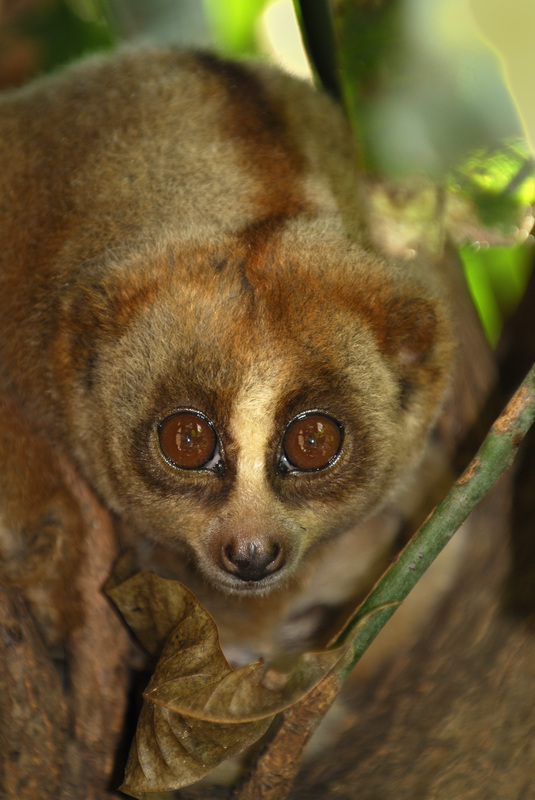 Credit: A. Latine, 2008. 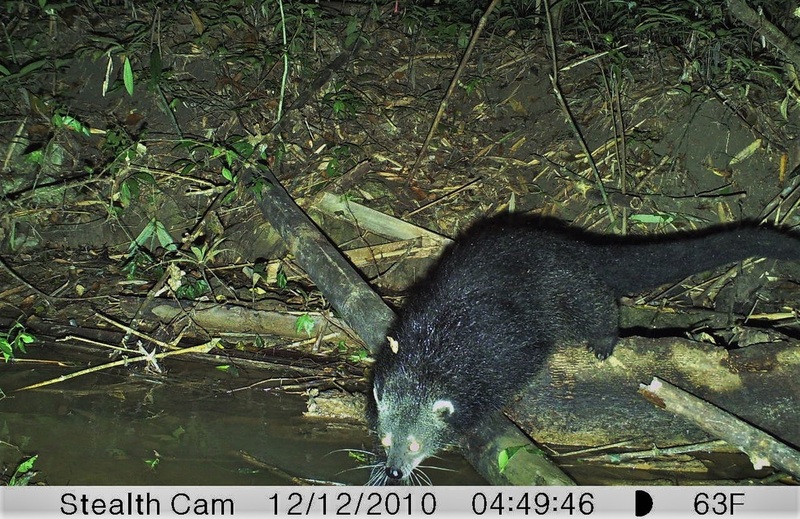 Binturong (Viverra binturong) is thought to be highly arboreal which makes conservation status hard to assess. A survey using ground-level camera traps captured just four sightings during 6-months and 5,000 trap-nights, in an area they are known to inhabit. Credit: W. Chutipong, 2010. 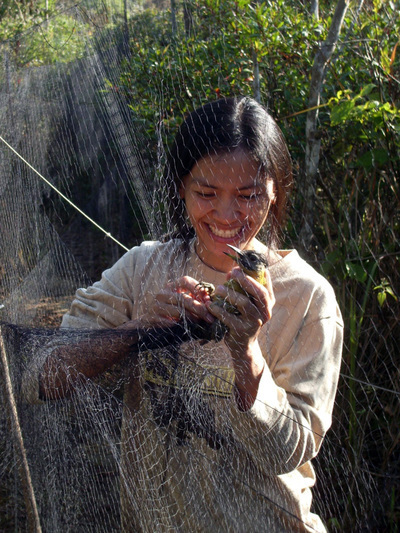 Laced Woodpecker (Picus vittatus) caught in mist net during survey of Puff-throated Bulbul (Alophoixus pallidus) in Khao Yai National Park, Thailand. Credit: G. Bottin, 2007. 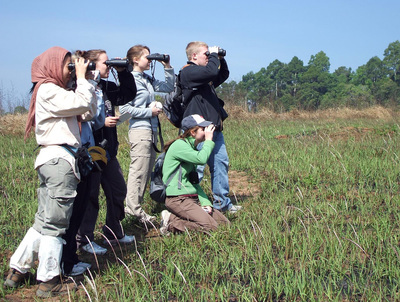 Birdwatching trip to Khao Yai National Park with visiting entomology students from University of Missouri, January 2008. Siamese Fireback and Puff-throated Bulbul teams take a break for lunch in Khao Yai National Park. 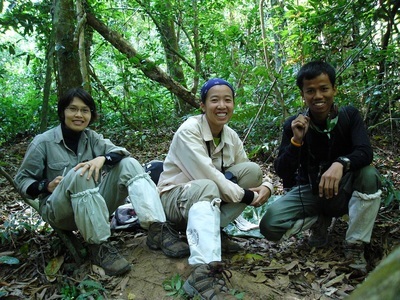 Credit: N. Sukumal, 2007. Double-spotted Red-webbed Tree Frog (Rhacophorus bipunctatus) is a common species across many forest types in Southeast Asia, but may be under threat from forest fragmentation and degradation. P. Saengtharatip, 2013. 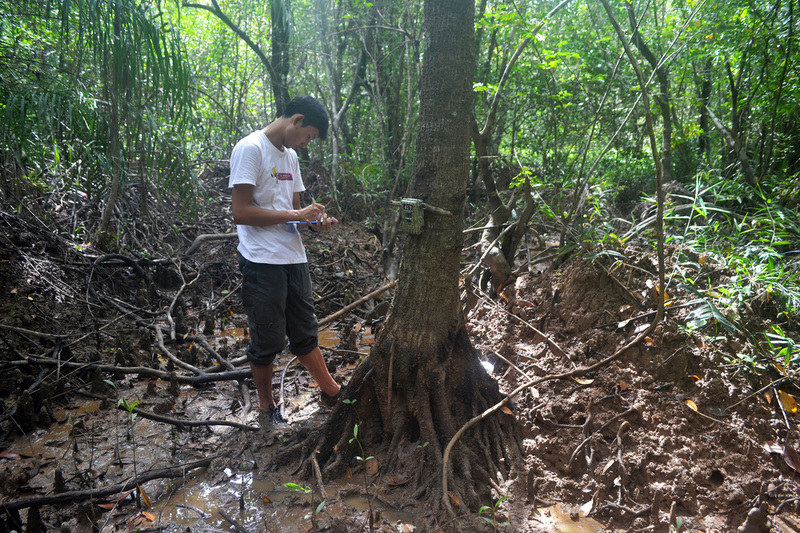 Setting up camera traps in mangrove forest of southern Thailand during a study of small carnivores. Location is everything - especially in mangroves where water levels can inundate equipment. Credit: A. Kamjing, 2016. 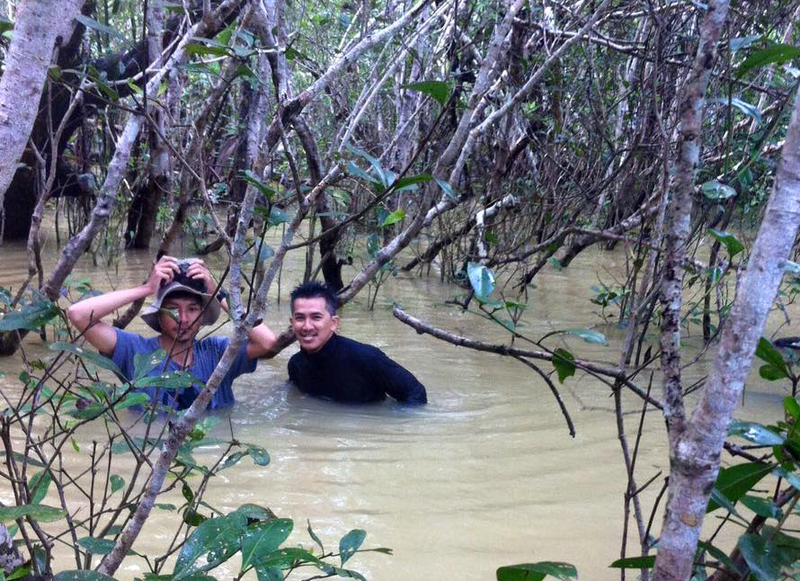 Small carnivore team retrieving camera traps during high tide in the mangrove forests of Ranong province. It's not easy to keep your data safe and dry! Credit: A. Kamjing, 2016. 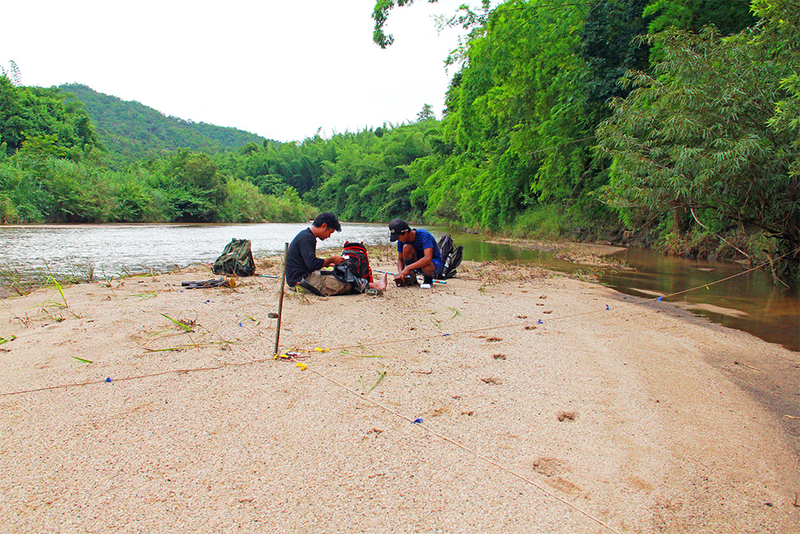 Small carnivore survey at Thalay Noi Non-hunting Area, Phattalung province, southern Thailand. Credit: A. Kamjing, 2016. 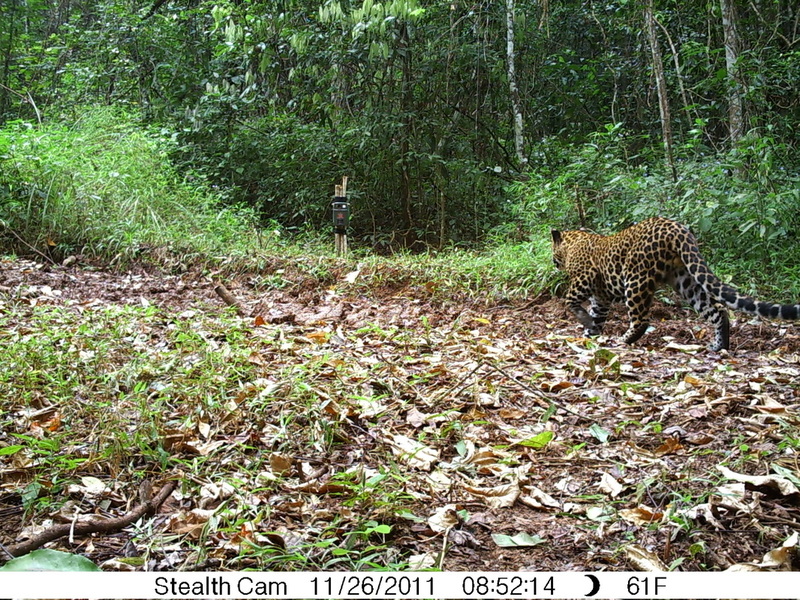 While studying small carnivore populations in Thung Yai Naresuan Wildlife Sanctuary, this leopard examined a live-trap from several angles - ultimately unsuccessful in her effort to extract the live chicken placed as bait. 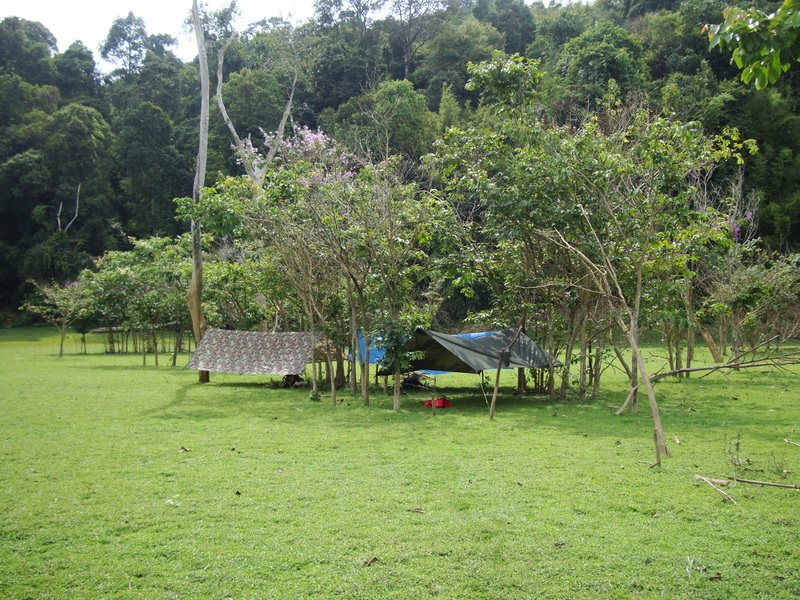 Credit: W. Chutipong, 2011. 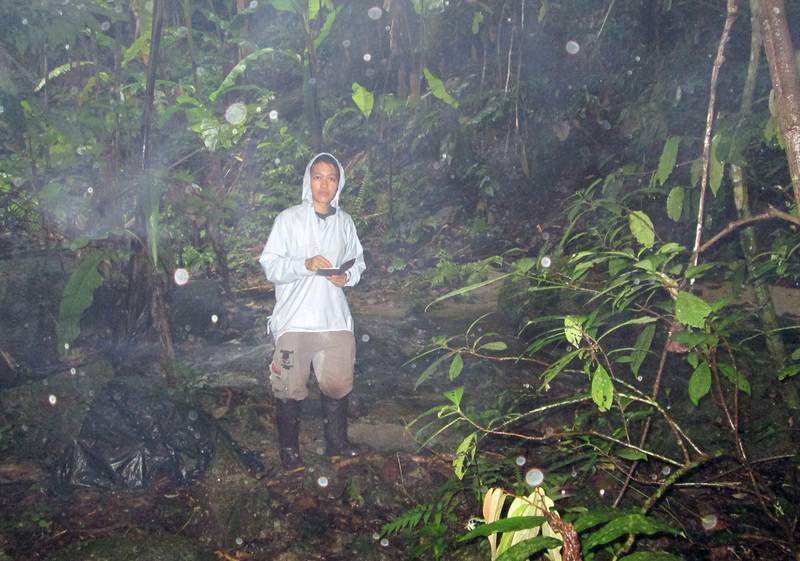 Frog survey along Huai Chang Tai Stream in the Huai Kha Khaeng Wildlife Sanctuary. 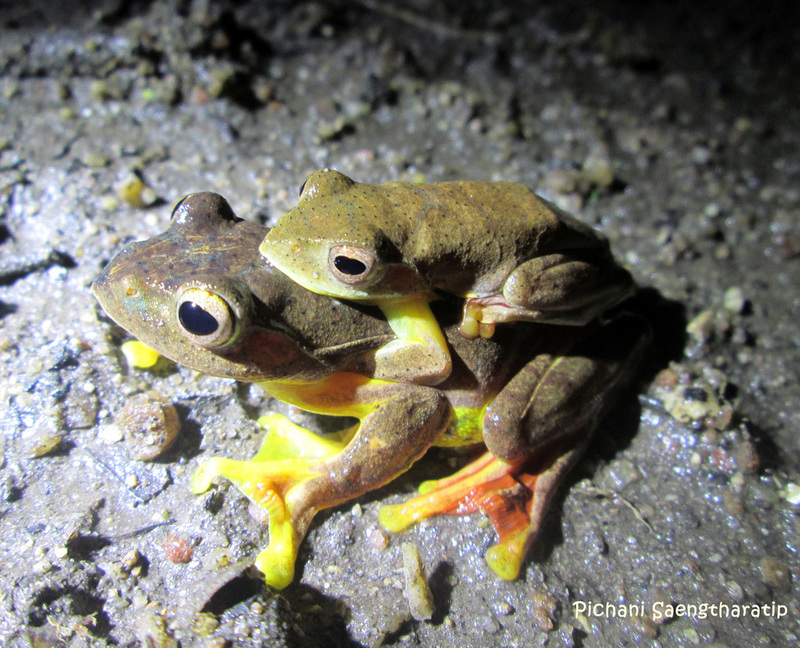 During one survey, 21 species were found! Credit: P. Saengtharatip, 2013. Field entomology course, facilitated by visiting Prof. Bob Sites from U of Missouri, at Khao Yai National Park. Credit: D. Khamcha, 2010. 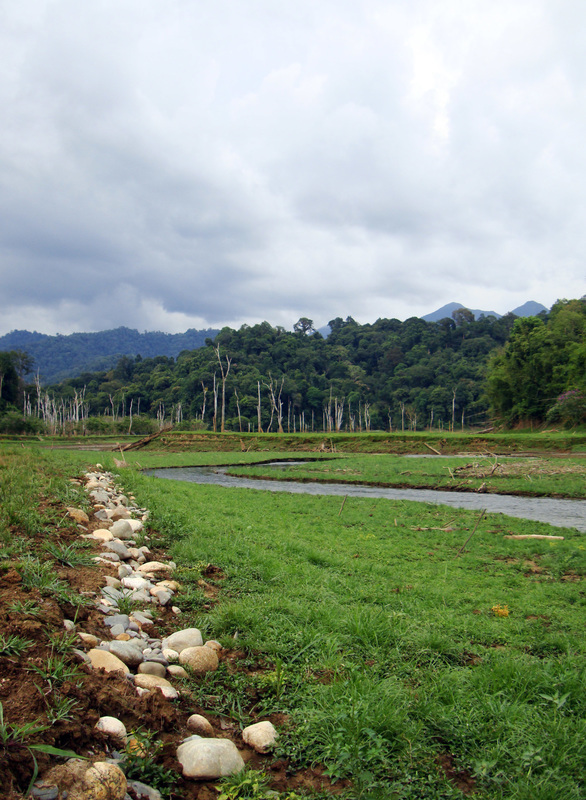 Khlong Saeng, just north of the confluence with the reservoir. 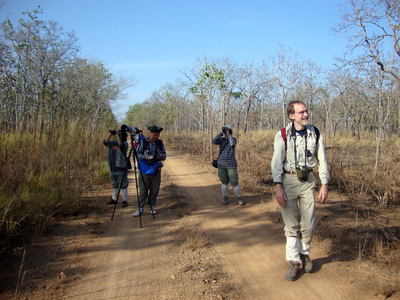 The area is rich with large mammals but relatively poor in avian species. Credit: G. Irving, 2016. 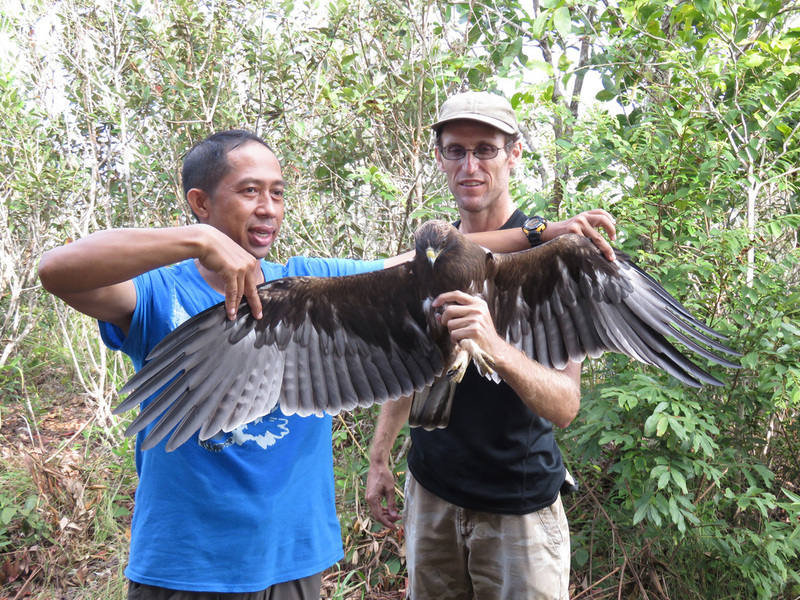 It took two months of effort, and a bit of creativity, but the team finally managed to capture a first year Booted Eagle (Hieraaetus pennatus) for study. Credit: J. Murray, 2014. 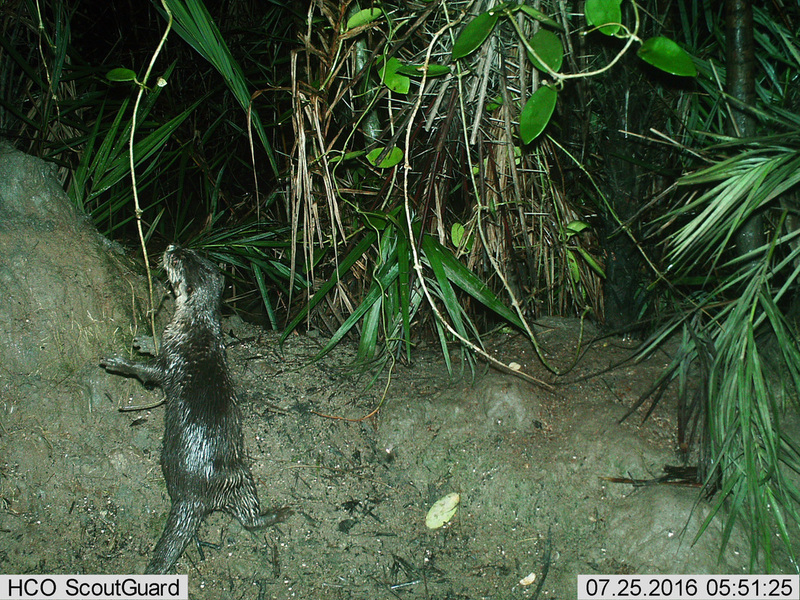 The vulnerable Asian Small-clawed Otter (Aonyx cinereus) resides in the mangroves of southern Thailand. Like other mustelids in mangroves, the species prefers to climb on termite mounds possibly a means of scent-marking a piece of ground that stays above water. Credit: A. Kamjing, 2016. 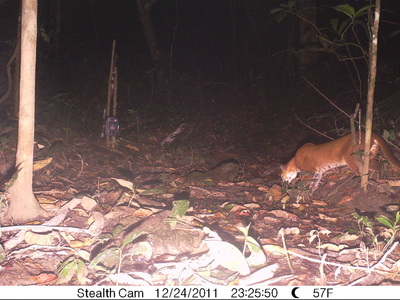 Asian Golden Cat (Catopuma temminckii) photographed during a survey of small and meso-predators in Thung Yai Wildlife Sanctuary of western Thailand. 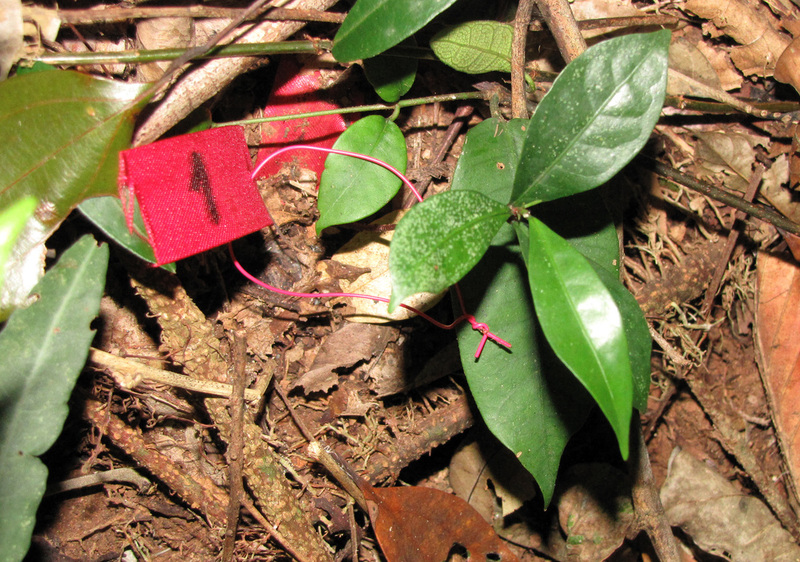 Credit: W. Chutipong, 2011. 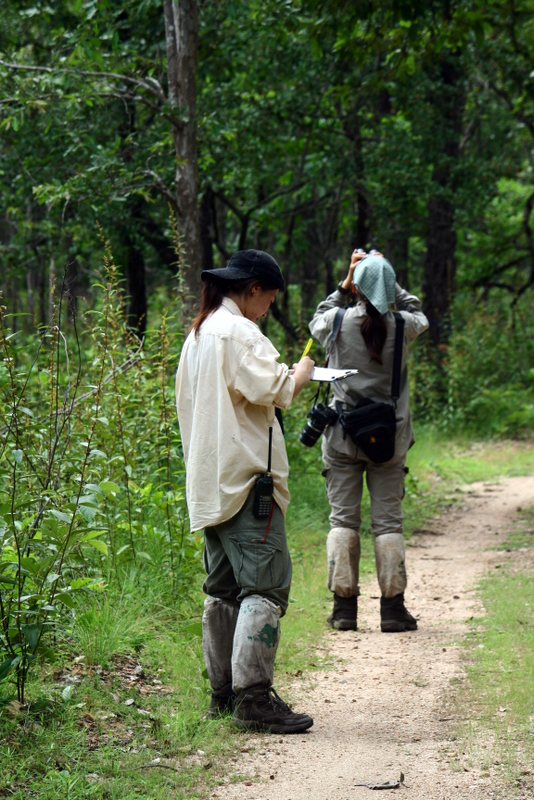 Students and adviser survey for the endangered Green Peafowl (Pavo muticus) in the dry dipterocarp forests of Yok Dong National Park, Vietnam. Credit: S. Suwanrat, 2013. 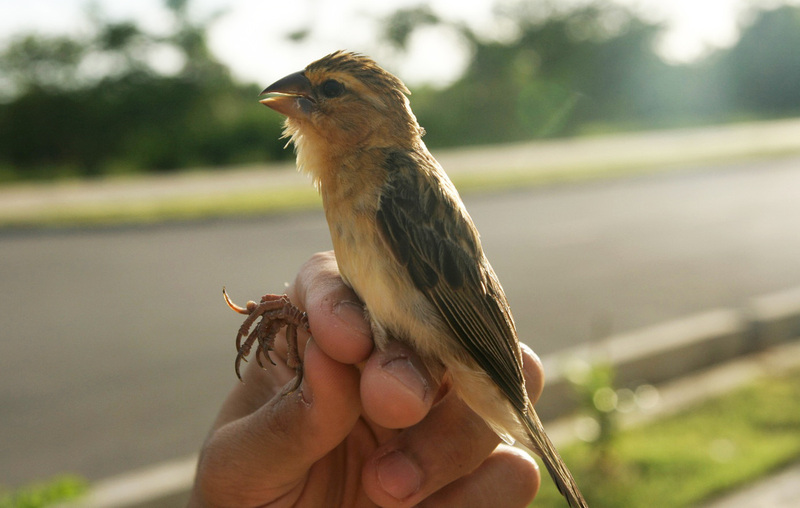 This Asian Golden Weaver (Ploceus hypoxanthus) was formerly resident on the university campus. Urban sprawl is reducing marsh habitat, and this gregarious "near threatened" species is one of many organisms disappearing from Bangkok's suburbs. Credit: D. Khamcha, 2009.